ALL four members of the rock group The Clash have been executed in Saudi Arabia, following a violation of strict Saudi rules against popular music. Joe Strummer, Mick Jones, Paul Simonon and Nicky Headon were lead into a square in the Saudi capital of Riyadh and beheaded in front of a crowd of thousands, following a 12 hour music binge that saw the rocking of a local Casbah earlier this week. A fleet of jet fighters were scrambled during the rocking, under the orders of the Saudi ruler King Salman, who had placed a ban on such frivolities. 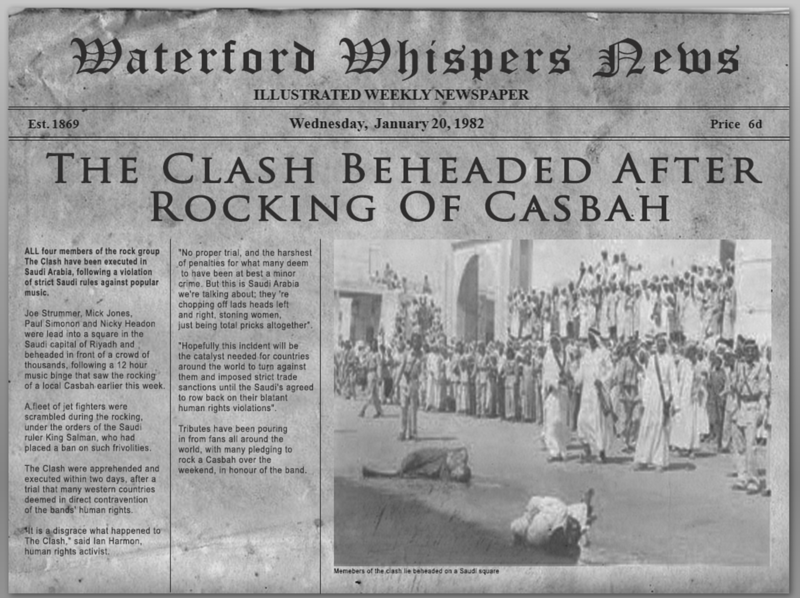 The Clash were apprehended and executed within two days, after a trial that many western countries deemed in direct contravention of the bands’ human rights. “It is a disgrace what happened to The Clash,” said Ian Harmon, human rights activist. “No proper trial, and the harshest of penalties for what many deem to have been at best a minor crime. But this is Saudi Arabia we’re talking about; they ‘re chopping off lads heads left and right, stoning women, just being total pricks altogether”. “Hopefully this incident will be the catalyst needed for countries around the world to turn against them and imposed strict trade sanctions until the Saudi’s agreed to row back on their blatant human rights violations”. Tributes have been pouring in from fans all around the world, with many pledging to rock a Casbah over the weekend, in honour of the band.